Most common economic thought on inflation comes from renowned economist Milton Friedman. His views are the ones most prevalent today. Interestingly his ideas spread into all walks of economic thought, accepted by many. Flip through an economics text book or read any of a billion blogs and you’ll find his ideas there no matter their leaning. Unfortunately his theory of inflation isn’t all that accurate and relies upon certain assumptions in order for it to work. This should by no means be limited to Friedman; all economists make certain assumptions about economics. The question here is to try and get the most accurate assumptions possible. This is not always an easy task. Real life is constantly throwing endless new variables and circumstances at us. This can make it difficult to keep up to date on the latest information. This in itself is a large undertaking, unceasingly keeping up with massive amounts of data coming at us. The task of collecting data can easily turn into a full time job. More to the reason why we have a whole employment field of economists to analyze it for us. Even a great deal of knowledge in economics can lead to a poor understanding of how inflation works and the assumptions made behind it. Since the global collapse of capitalism in 2008 the topic of inflation has been brought to the fore of economic debate, particularly on the internet. There has been much screaming from the right and the far right saying that hyper inflation is around the corner and going to strike us at any moment. For me this is like the “boy who cried wolf” situation. Anytime a Democrat gets elected the right screams a lot of things like gun seizure and hyperinflation are due. When we listen to the far right they say hyperinflation will happen in two to four months. Of course they have been saying this for around fifty to forty years. So I tend not to listen, but it is worthwhile now and then to go back a refresh myself on their argument. This is completely natural, anytime we face a crisis we are forced to take a second look at our prevailing ideology. It’s also a smart thing to do, we might see a flaw in our ideology somewhere that lead to the disaster we face. There are two approaches we can take to this: 1) we can stare very hard at the mechanics of our system and try to poke it to see if there is a leak anywhere in its operation. We may even return to its drawing board to see if there was something we missed. Or, 2) we can take the path of the religious and merely grip tighter to our faith when it is challenged. I’m sure we’re all familiar with the Christian in a crisis of faith praying twice as much repeating the prayer twice as fast. In our modern society we have seen both reactions take place in America. The now famous line by Alan Greenspan comes to mind when speaking about our prevailing ideology: “Yes, I’ve found a flaw. I don’t know how significant or permanent it is. But I’ve been very distressed by that fact.” While I disagree with the capitalist mode of production and its corresponding social relations, I do give the man credit for acknowledging that there is a flaw and it must be looked after or the consequences will become much worse. This is the smart thing to do, question everything you think you know about the way things are run because you never-know where you don’t know something. Here I’m tempted to recall the historic line by Donald Rumsfeld: “There are known knowns; there are things we know we know. We also know there are known unknowns; that is to say, we know there are some things we do not know. But there are also unknown unknowns – the ones we don’t know we don’t know.” To put it plainly for you the reader, Greenspan is saying there are unknown unknowns that lead to the catastrophe we witnessed. Well, known to bourgeois economics anyway. On the other side we have a desperate cling to ideology in a time of crisis. Unfortunately the people who do this are being given far more credence than they deserve. Their reaction to the collapse is one that doesn’t analyze anything and merely grips the fundamentalist texts of capitalism even harder. Many simply resort to denial and insist that the problems can only stem from straying from the righteous path. In economic and social theory circles these people are known as libertarians (also “Anarcho”-capitalists). Their idea is that we must return to a principal that hasn’t corresponded to material reality in hundreds of years, or at all. It is from this fundamentalist view that we get the iconic libertarian phrase, “that’s not real capitalism”. The statement indicates a sincere (yet very misguided) wish to return to the economics of the Founding Fathers. We face the situation where libertarians won’t question the economic system of capitalism to see if it isn’t perfect. Much like the fundamentalist Christian won’t question the Bible on certain issues no matter how flimsy they are. Ron Paul is one of the most iconic of libertarians who I would think is probably quoted the most on it. (I’m not sure I’m just guessing based on my own experience.) He’s constantly insisted that the US return to a system of capitalism the prevailed in 1776. Of course for some reason he doesn’t realize that the productive forces and material reality of America has changed since that time. He sounds like an old man claiming things were better in the 50’s because there was a more proper Christian family structure (nuclear family). This is why we need to really look twice at the basic assumptions we have about this system. More specifically we should look at our prevailing ideas about inflation and what causes it. The established counter assumptions of inflation that exist are not entirely accurate and also must be called into question. This is the very point of the work you are reading right now. It is based off of a blog post I read by John T. Harvey of the Forbes website. I read his post where he takes a critical look at inflation as it is laid out by Milton Friedman. He notes that Friedman’s theory of inflation is wrong because it makes certain assumptions about the variables in the equation of exchange (MV = Py). When Harvey looks at them in a different light we can see the mistakes Friedman makes. Along with this he also covers the misconceptions that everyday people have about how the Federal Reserve expands the money supply. A view that is not unique to that of the libertarians, it’s a misconception that many, many people hold. It has spread quite rapidly because of the internet. The right wing has fallen for it because of the rantings of Ron Paul. The left has fallen for it, I think, because of the popular Zeitgeist movies. They think the Fed just prints more money and it goes out into the public without question. To use Friedman’s example, a helicopter just comes along and dumps it on the country. What Harvey does is respond by correctly showing how the Federal Reserve creates more money and gives new light on the variables in the equation. His new light makes much more sense than Friedman’s does. It also corresponds to reality in a way Friedman’s couldn’t. Harvey is taking the material conditions of our modern capitalist system into account where Friedman relied too much on Econ 101 to formulate his theory. After reading his blog post I noticed some things were left out that caused Harvey not tell the whole story. Of course, as a Marxist, I am going to have a different view than he does. I’m only seeing the equations and its interplay with the other variables from a Marxist perspective. I think my view certainly has something to add to the topic. It is my hope that this work will increase the reader’s understanding of the nature of inflation and how it works. On top of that I hope it increases the reader’s understanding of Marxist economics. Friedman puts forth a basic concept of how inflation occurs in the economy. This concept has been almost universally taken as truth with little or no investigation by libertarians. The idea is this: printing more money causes inflation. It’s pretty simple and gets straight to the argument. It’s not surprising that it is taken so easily, it’s short and simple to understand. That’s not a criticism mind you; it’s just an explanation for the ease of its travel around opinion of non-economists. Superficially it makes a lot of sense and seems reasonable. We hear about this all the time, the talk of QE or Quantitative Easing has entered into our mainstream economic language. We’ve now gone through three rounds of QE which has a lot of people nervous. This is the standard equation that all economists use, there is nothing outrageous here. This is not some Marxist conception of what the equation should be or anything like that. What is before us is used by every economist in the world (or something similar). I’m sorry to have to go off track again but some people don’t understand this. They automatically assume that when a Marxist writes something, it has been changed in some way to fit another view despite the fact it has been written in plain bourgeois economic formulae. I’ve done no such thing here, when I do I will state that I am so that way no one will get confused. From this we can now get our equation that shows what inflation is according to the commonly accepted belief of it. The idea is that if you simply increase the money supply then the price of the goods and services will automatically rise with the drop in the value of the dollar. This devaluation of the dollar occurs because there is now more money in the system. This view is based off of certain assumptions that are made about the variables in the equation that are commonly accepted without question. The mistake is made when we assume certain things about the very nature of the variables. This can be very hard for some people because our opinion and views of them can vary according to things like life experience which can be very subjective. Friedman (and many others) for example sees them in an overly simplistic way that leaves out much of the context of society and the prevailing social forces within it. What do I mean by this? I’ll explain later on when it’s appropriate to get into it with more detail on it. For now we’ll take a look at exactly what assumptions are being made when someone holds the inflation view M ==> P. Meaning the assumptions that have to be made in order for this view point to work. I’ll be quoting directly from the Harvey article for the sake of simplicity. M: That which is money is easily defined and identified and only the central bank can affect it’s supply, which it can do with autonomy and precision. V: The velocity of money is related to people’s habits and the structure of the financial system. It is, therefore, relatively constant. P: The economy is so competitive that neither firms nor workers are free to change what they charge for their goods and services without there having been a change in the underlying forces driving supply and demand in their market. y: The economy automatically tends towards full employment and thus y (the existing volume of goods and services) is as large as it can be at any given moment (although it grows over time). Taking these assumptions of the variables we can now go back and look at our equation of exchange and see how it is that the “money growth ==> inflation” belief comes about. It is theoretical here that P cannot change on its own and y is currently assumed to be as high as it can be given the current level of technological development and availability of resources. When we look at V we see that it is insisted that it is constant. So what remains? Obviously we see that P is the only variable that is assumed to have the power to change. By working on these assumptions it is only logical to immediately look at P when we see any fluctuation we observe or introduce. This is why P is automatically said to be the cause when inflation occurs. This is what leads us to Friedman’s famous claim about the Federal Reserve just printing more money. In his book “The Optimum Quantity of Money” Friedman uses the example of a helicopter flying in and dropping new money into the money supply. By this we get the idea that the central bank has the power to simply double the money supply at will. This is what Friedman’s helicopter example is supposed to express. Alright, let us work under the postulation that this occurs. We must go back and look at why this can be the only outcome. Because we are operating under certain assumptions that only allow us to have this one conclusion. “Friedman says that y is constant at the level associated with the natural rate of unemployment, while V is indirectly related to agents’ demand for cash. When people want to hold more cash, V, the rate at which they spend cash, naturally falls, and vice versa. But, Friedman further specifies that V is relatively constant and so, therefore, is the demand for cash.” The conclusion is that when the central bank created more money it means people are now holding more money than the care to have. It’s saying that the Federal Reserve has increased the supply of money beyond the demand. It assumes that the demand remained at the original level so the Fed printed money because it felt like it. (Or that it was a part of an evil conspiracy to destroy America.) The only possible outcome of an increase in the money supply by people who hold this view of inflation is that people go out and spend this money on goods and services. But they don’t purchase any more or any less because they are also assuming in aggregate, more does not exist. The only result is that the suppliers of goods and services bid up their prices up. Voilà, money growth led to inflation! As we can see there has been no investigation as to why inflation occurs in an economy. There has only been a set of assumptions that can only lead to this one conclusion. These assumptions of the variables in the equation are in reality preconceived notions of modern capitalist society. The variables are supposed to reflect truths of the system in which we live, yet their function cannot produce a scientific result. The assumptions are made about the equation because bourgeois economic theory makes certain assumptions about the social relations between individuals that spring from the productive relations between them. Harvey does correctly point out that Friedman’s assumptions are incorrect. However what he does not do is determine why they appear the way they did. The reason is because of the notions that capitalism makes about people and their motivations that are not true, they are only repeated for the sake of preserving the capitalist economic order. Take for example the claim that people only act in their own self-interest, yet if this were really true, charity could not exist, but this is considered something society can rely on. In the next section I will be discussing Harvey’s response to Friedman and these incorrect assumptions that are made, as well as giving us alternative explanations as to why inflation occurs. Harvey’s response to Friedman and to the commonly held belief surrounding inflation is very important. In real life much of this is completely untrue, particularly on currency creation. The problem here is that this explanation is very superficial and is usually given out at Econ 101 lessons. Harvey points out that people only seem to remember the “M ==> P” part and not the assumptions surrounding the variables that lead to it. When people do this they fail to scientifically understand why they arrive at the conclusion they do. We need to always keep in mind (for many things not just economics) that our assumptions have to change over time as material conditions change. Unfortunately bourgeois economics isn’t concerned with material conditions and instead stick to such assumptions, often starting from a priori information. Harvey suggests that if you increase the money supply there is no reason that it won’t result in more consumer spending. People will go out and spend that money which businesses will gladly accept and use to invest in more products and services to meet the increased demand. The theory holds that this will stimulate job creation in order to meet that new demand. This is what the government is trying to do right now with deficit spending. This is the plan that those who are opposed to the current economic policy are trying to stop from happening. Whether or not it will work is another matter completely, I’m merely giving Harvey’s argument at this point. Harvey goes on to discuss the V in the equation. He says the velocity of money is not constant. I whole heartedly agree with this statement, consumption of goods and services does not remain at a near fixed rate. It fluctuates all the time given the various material conditions consumer and the economy find themselves in. As an example he gives, consumer spending tends to decline during a recession. It’s only natural that when people become concerned that the economy is going to crash they tend to begin saving more money than they normally do. When they lose their jobs they don’t have money to spend. Of course, they’re concerned about paying bills in the future because of instability that may be just around the corner. None of us really knows when we might lose our jobs, especially if we’re among the working class. We worry even more so if we’re in the minimum wage income bracket. 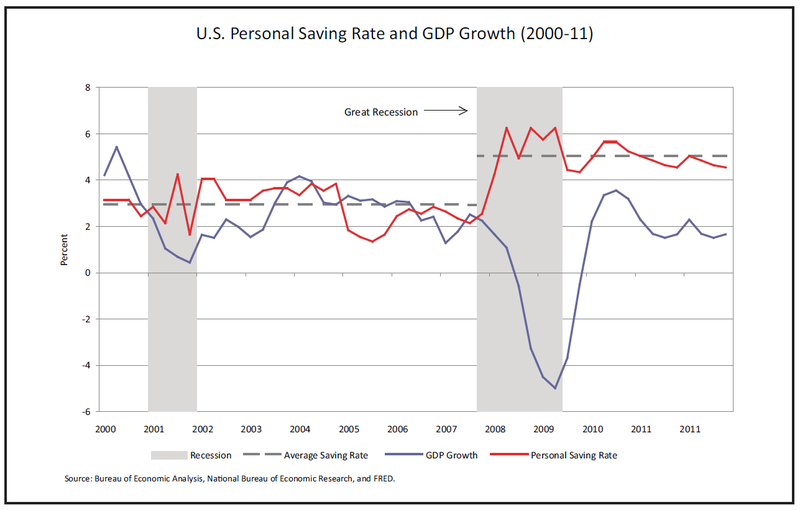 We can definitely see for economic data that people do save during a recession. A good question that Harvey asks here is what constitutes money? What exactly in the system counts as money? It’s a very good question as even economists have differing definitions of what money is. Is it the physical currency that is in your pocket right now? Does it include the ones and zeros that exist on the digital balance sheets of the private bank? Is it the line of credit that exists on your credit card? If you make a purchase on it does that count as money? These are all questions we should ask ourselves when we’re trying to determine what the supply of money actually is, what constitutes money that is out there. This is, I say again, why economists have several possible definitions for what money is. Now because of this act, it becomes suspect how much money is actually in the economy. If we don’t know how much money there is, what interference does this have on the operationalizing of the equation? To make matters even worse for determining what the money supply is we have to take into account the private banking sector. After all, banks expand the money supply every time they create a loan. Yes this is fractional reserve banking that is creating new money out of thin air. The bank keeps only a fraction of total necessary reserves in the in bank’s vault. This goes completely against the assumption that is made about M. When we acknowledge this it completely alters the possibilities surrounding the equation of exchange and correspondingly the possible causes of inflation. To finish off the incorrect view “money growth ==> inflation”, Harvey reminds us that this notion that the Federal Reserve simply dumps new money into the economy is completely wrong. Milton Friedman is just simply outright giving a complete falsehood here. Remember his example of the helicopter flying in and dropping new money in the money supply? It’s not a metaphor that is intended to make the process seem simpler to understand, he is claiming that is how it works. Supposedly the Federal Reserve just prints more money and drops it on the public without their consent. But there is a problem with this, it’s not true, this is not how money is created. This incorrect view of money creation is a part of the misguided assumptions made about the variables; particularly the M. Friedman uses the helicopter metaphor because it’s the only way for the idea that simply increasing the money supply causes inflation can work. M: A precise definition and identification of money is elusive in a modern, credit-money economy, and its volume can change either with or without direct central bank intervention. In addition, the monetary authority cannot raise the supply of money without the cooperation of the private sector. Because central banks almost always target interest rates (the price of holding cash) rather than the quantity of money, they tend to simply accommodate demands from banks. When private banks communicate that they need more reserves for loans and offer government debt to the Fed, the Fed buys it. It’s the private sector that is in the driver’s seat in this respect, not the central bank. The central bank’s impact is indirect and heavily dependent on what the rest of the economy is willing to do (which is, incidentally, why all the QE and QE II money is just sitting in bank vaults). V: The velocity of money is, indeed, related to people’s behavior and the structure of the financial system, but there are discernable patterns. It is not constant even over the short run. P: While it is true that factors like production bottlenecks can be a source of price movements, the economy is not so competitive that there are not firms or workers who find themselves able to manipulate the prices and wages they charge. The most important inflationary episode in recent history was the direct result of a cartel, i.e., OPEC, flexing its muscle. Asset price bubbles can also cause price increases (as they are now). The key here, however, is that P CAN be the initiating factor–in fact, it has to be, since M can’t. y: The economy can and does come to rest at less-than-full employment. Hence, while it is possible for y to be at its maximum, it most certainly does not have to be. “…the most important inflationary episode in post-WWII history was that during the 1970s and early 1980s. From 1968 through 1972, consumer price inflation averaged 4.6%. Over the next ten years it was 7.5%. What happened? What caused this sudden and dramatic acceleration in prices? Did the Fed accidentally print too much money? As already explained, that can’t happen–you simply can’t raise the money supply above the demand. M did rise, however, and largely proportionally to the increase in P. This is a much more realistic story of those events. Harvey gives a very good refutation of the questionable assumptions made by Friedman concerning the variables in the equation of exchange. He’s adequately shown why they are incorrect, offered his own assumptions and shown why they are superior. In the next section I will describe the limitations of assumptions made by Harvey on the variables, and assumptions on fractional reserve banking. I am intending to look at this not only from Marxist but also a bourgeois perspective. The trouble with discussing inflation is not just getting past the false concept of it, printing more money causes inflation and so forth. The additional problem is that people don’t know how to correctly define what inflation is. Harvey gives a very good straight forward explanation: Inflation is simply a rise in the average price of goods and services in the macroeconomy. Which particular goods and services depends on the measure we are examining. This gets right to the heart of the matter. Too often people (particularly libertarians) see the increase of the money supply itself as inflation. No, it is the increase in prices of goods and services that is inflation. This is the main point we have to keep in mind as we look further into other causes of it. Harvey did a blog post about two weeks later where he gives some really good examples of inflation where the cause had nothing to do with the creation of new money. I’ll be giving those here along with my own to give you the reader a better view of the different forces in the economy that can cause this misunderstood problem. Everyone remembers the oil shortage during the Yom Kippur War in 1973. The war began when a group of Arab states led by Egypt and Syria attacked Israel to take back land that had been stolen including the Sinai Peninsula. (In addition to attempting to stop the Israeli genocide of Palestinians.) Regardless of the cause of the war, it happened. At some point the US became involved by sending arms supplies and $2.2 billion in appropriations to Israel. In response to this Saudi Arabia declared an embargo against the US which was joined later by other OPEC countries. What they did was reduced oil supplies by 5% leading to what today we call the 1973 energy crisis. This was possible because there was a cartel and they were able to avoid competition. The increased cost in fuel had a huge effect. Transportation alone is a good chunk of the cost of products. It also plays a big part in the production of plastic goods. Businesses suddenly became faced with a shortage in funds unable to meet production costs. As a result they had to return to the banks in order to get more credit for the cycle of production. This caused the banks to go to the Federal Reserve and request more money. Thus the money supply was increased. As we can see the increase in the money supply resulted not from the Friedman-copter making an unrequested delivery. The increase in prices (the inflation) was not driven by the increase in the money supply, just the opposite in fact. The increase in the cost of fuel increased the cost of production leading to all kinds of businesses seeking more credit to make up for it. There were other consequences as a result of the oil shortage. Some firms actually sold assets to meet the increased cost in fuel instead of borrowing. There were even households that took out consumer credit to cover their bills during this time which also added to the money supply. This phenomenon is called “market power”. OPEC has the ability to restrict the supply of oil because they have so much control over the supply of it. Once in a while this can happen; a firm makes a grab at extra profits because they hold so much control over the supply. Of course they can only go so far before people just stop purchasing their product, but this was impossible to do with oil as so much of the world’s economy depends on it. There are other examples of this happening in the economy but this one does the job of explaining it. Another cause of an increase in prices can be a sudden increase in demand in a sector that is not prepared for it. If there is, for example, a housing boom there can be supply problems. Take for example several years ago when oil production in Alberta, Canada began to really take off. Many, many people immediately moved there to take advantage of the new demand for labour in the energy sector from new production. When tens of thousands of people moved there housing became a more serious issue. Many of these jobs were well paying jobs that allowed people to purchase homes. As a result there was a housing boom in the province due to a sudden increase in the demand for homes. So you have all these home builders suddenly having a great deal more homes under construction than before. This sudden demand can cause shortages in certain building materials such as lumber. It takes a while for the market mechanism of incentivising others to enter into producing these same materials to begin. In the mean time there is a bottle neck in the supply. When this shortage goes on contractors who build the homes have to bid up in order to get the materials they need. These price increases have a ripple through the economy. Consumers and firms now require a larger money supply in order to operate. The Fed gets the signal for this need from the banks and accommodate accordingly. This phenomenon is called “demand pull”. Here we can see it is an increased demand in a material (or several others like brick) suddenly that can cause a rise in prices that can spread out into the rest of the economy. Because of the sudden demand for housing, including rents, Burger King for example had to raise it starting wage to $15 to $22 an hour because of the cost housing and a lack of labour. This is an example of how “demand pull” can have a further effect in the economy. When the market for an asset booms it can have a huge affect on price, meaning inflation can be injected from the asset market. This one is especially true today as finance capital become more and more powerful. The link between the cost of goods and services and financial assets is not always solid; sometimes there is no link at all. It’s particularly important to keep this one in mind as it takes up so much of the US economy, and can therefore exert so much influence on it. This is put well by Harvey here: Witness the 1990s, with a massive increase in stock prices but very little movement in the consumer price index. However, lines of causation can exist, particularly though commodities futures. Here is what happens; speculative money makes a guess that the price of something is going to go up in the future, anywhere from a few days to a few decades. Some speculator says that the price of oil is going to go up in a few weeks; we see this on the news all the time. In response, those who are actually selling the commodity withhold the supply in favour of the time in the future when the price will be higher. They do this because there is an incentive to do so, the supposedly higher price in the future will lead to higher profits. The rising spot price then convinces people that his speculation had been correct and increases his prestige. Often as a result the producer of the commodity takes the blame for the increase in price. The money supply does increase as agents take out loans and sell government securities. The problem here isn’t the increase in money, it actually stems from the power speculators have. This one of truly great ironies of capitalism is that something that doesn’t exist (guessing what will happen in the future) has such an effect on something real and physical that exists here and now. Literally nothing has happened to the supply of any commodity, but because someone is guessing something, the price can drastically increase. What someone thinks the market is going to do can have more of an effect than what is really going on. This one is pretty simple and doesn’t require much of an explanation. Harvey does it justice: If a storm rages through the Gulf of Mexico, taking out oil derricks and refineries along the way, this may well raise the price of oil and gas. As it should, for this creates incentives to build more derricks and refineries and for consumers to find alternate energy sources. Again, this is what capitalism is supposed to do. In terms of who wins with this sort of inflation, it’s obviously more complex since it depends on whose derricks were destroyed and who gets to build new ones. In any event, this, too, can lead to a rise in the money supply and there is no logical reason for the Fed to block this. Now I would like to add my own example. Let’s take a much more complicated inflation situation and look at it closely. What I’m going to talk about here is what happened in Zimbabwe to cause their hyper-inflation situation. First off let’s deal with the immediate accusations that are made. This is not what happened to the Weimar Republic, this is not proof government deficits will generate hyper-inflation and this is not proof that a fiat monetary system doesn’t work. The roots of the inflation lie in the end of its colonial era when Whites owned about 70% of the country’s productive land. After the revolution that ousted the White-only rule, the fighters immediately began taking land that was owned by the White minority and thrust it into the hands of Black farmers. This was an absolutely correct thing to do as a measure of ending the remnants of the colonial period and create equality. (If Whites had been left to own 70% of the productive land they would have held all the economic power.) The problem is that the land reform was not so much implemented, as it was a grab from one group to another. When we view it through the lens of economics it was a disaster. Unemployment rose to 80% and most people are just scraping by on minimum wage. The land reforms represented the first big contraction in potential output. A demand contraction was needed but it was impossible to carry out because 45 per cent of the food output capacity was destroyed. The Confederation of Zimbabwe Industries (CZI) publishes various statistics which report on manufacturing capacity and performance. Manufacturing output fell by 29 per cent in 2005, 18 per cent in 2006 and 28 per cent in 2007. In 2007, only 18.9 per cent of Zimbabwe’s industrial capacity was being used. This reflected a range of things including raw material shortages. But overall, the manufacturers blamed the central bank for stalling their access to foreign exchange which is needed to buy imported raw materials etc. Now, because there is a shortage of food, the central bank used its foreign reserves to purchase agricultural imports. So we can see the problem here, domestic food production was almost completely ruined so they had to rely on imported food which blocked manufacturers from access to foreign exchange. Essentially what happened was that both ended up getting ruined in the end. Much of the goods and services end up not being imported because of the high import duties. When you consider both of these factors together we get the 80% unemployment rate. Having this is destroying aggregate demand for goods and services. Further, the response of the government to buy political favours by increasing its net spending without adding to productive capacity was always going to generate inflation and then hyperinflation. But while the hyperinflation was almost inevitable it provides no intrinsic case against a government that is sovereign in its own currency and who runs permanent deficits to pursue full employment – under the guidelines specified above – responsible fiscal management. When you so comprehensively mismanage the supply side of your economy as the Zimbabweans did the only way to avoid inflation is to severely contract real spending to match the new lower capacity. More people would have starved and died than already have if the Government had have cut back that severely. But this disaster has nothing much to do with budget deficits as a means to ensure high levels of employment in a growing economy (where capacity grows over time) where the non-government sector also desires to save. A private sector investment boom would have caused the same outcome both in inflation and the political problems of fighting it. So will the hyperventilators also say we should not have net private investment? The historical context is important to understand because it created the political circumstances which have made the hyperinflation inevitable. But these historical vestiges from the colonial white-rule bear very little relevance to the situation that a modern sophisticated fiat monetary system will face. What Harvey says about the private banks not being forced to take money from the Federal Reserve is true. I however have seen a problem that has arisen out of the 2008 Global Collapse of Capitalism. The role of banks in any recession is to lend money out so that it may be invested (or spent) in order to stimulate production which would lead to jobs being created. In turn those newly employed people will be taxed and they will spend their income on goods and services they need to survive. Unfortunately the banks don’t seem to be lending out the money they have taken from the Federal Reserve. The money that is being put out is seemingly being kept in the bank’s vault and written in as profits. Some of it is being loaned out, but much of what is actually spent on is their own investments, not loans out for people to start businesses. Jobs have barely been created while bank and Wall Street profits have sky rocketed. The largest banks, including Bank of America, Citigroup and Wells Fargo, earned $34 billion in profit in the first half of the year, nearly matching what they earned in the same period in 2007 and more than in the same period of any other year. The question then arises, why are the banks doing this? Despite the beliefs of some people, banks actually do harmful things for a reason. They are not merely secret evil communist organizations as Tea Partier and Libertarian organizations claim. Banks do horrible harmful things, but I as a Marxist recognise it as a part of their function. What is economically rational is not usually what is socially rational. The Global Collapse of Capitalism in 2008 taught the banking and financial industry a very hash lesson. They found that they were not invincible and that recession can still happen. Often many claim that another one is impossible supposedly because we learned from the last one. I’m not accusing traders and whatnot of thinking this, but it was an idea that was spread around. Banks learned there are limits to how much fictional money they can create as is what happened with the housing crisis in the form of mortgages. The lesson they learned is that they need to keep a greater reserve in vaults. (Of course they should have learned not to be so risky, but they’re not going to acknowledge that. It’s tempting here to get in to the whole cause of the Global Collapse of Capitalism, but I’ll leave that for another paper.) Several banks went bankrupt and ceased to exist. This was a scary wakeup call to the financial industry. They needed something to help prevent this in the future, or at least minimize the impact. What they were looking for was a preventative measure(s) that doesn’t threaten profits. Having larger reserves to back up the amount of fictional money they create through a fractional reserve banking system seemed like an ideal solution. When the debt all failed they lost a massive amount of the money they had, because remember, that amount created through loans also counts in the money supply. What many may have seen as a problem is the lack of “real” or physical currency in reserve. Of course this could not have avoided the crisis, but a larger reserve could have made the difference between a bank going bust and it just barely surviving, albeit very unhealthy. The preventative measure is, keep larger reserves in the vault. The best way to do this is to ask for it from the Federal Reserve. If a bank asks for the money and then keeps it, there is no risk for them. The money is real and it doesn’t count as a subtraction from any investments or deposits they current hold. They didn’t have to sacrifice anything in order to get it, nor did they have to raise the money by subtracting from their investments or raising banking fees. This is the perfect solution for them. All of this perfectly fits within what Harvey said about banks taking from the Federal Reserve. “You cannot force anyone to sell a Treasury Bill in exchange for new cash; you cannot force a private bank to accept a loan from the Fed; and private banks cannot force their customers to accept loans.” This is what happened; no one forced anything on anyone else. It wasn’t necessary; the banks wanted the money so the Fed seeing the demand created the supply they asked for. The only problem with what was laid out by Harvey is not recognising that the banks can ask for money if they don’t intend to loan it out. The assumption he makes is that a bank is only going to ask for money from the Fed if they see a demand for it. This is incorrect, as we have seen the money has been granted to them in three rounds of QE, but has not been given out as demonstrated by the previously given data. It is not being loaned out. Essentially profitable production has to begin once again in order for the economy to recover from the recession. The money goes into production where materials have to be purchased; people are hired creating jobs, they produce commodities that are sold. This begins the recovery of the economy which beings with an increase of production which usually requires a loan of money ahead of that production to be paid back when profits are realized. All of this means the banks have to loan the money they took from the Federal Reserve out. So if this is all it takes to repair the economy, why aren’t they doing it? Here comes the contradiction: Banks have to loan out in order to repair the economy, but the banks are not loaning out because the economy is bad. The very thing the banks need to do to end the recession they won’t do because there is a recession. This is one of those contradictions that I alluded to earlier. Banks are justifiably hesitant at this time to loan out money because the average household is carrying a large amount of debt. In addition they can also see that the financial industry is returning to the same risky operations that ignore the production of commodities and services for quick return trickery. On the other hand they have to loan this money out because it is the only way for the economy to recover. As I have shown previously the banks have the money, they’re just not loaning it out. If we’re giving the banks the money and they’re not loaning it out, what do we do about it? What can we do about it? In essence, right now, there is nothing we can do. This is why I think the Fed keeps giving the banks more money; they’re hoping they will eventually start giving it out. It seems rather senseless doesn’t it, repeatedly giving the banks more money under the premise that they are going to use it for loans? Rightly, the Fed shouldn’t say no to giving money to help repair the economy. All the Federal Reserve can do to help is supply that money to the banks upon request. The question before us now must be asked: What would it take to solve this problem? Well one primary thing in my view: A mechanism with which to force the banks to lend it out the money they have been given. This may be a bit tricky, private banks are not too fond of regulators or government telling them how to run their business. But then again thanks to that same attitude the world went into a major recession primarily because of their inability to regulate themselves. Clearly we are in a situation where the money needs to be loaned out and the banks are not doing it. 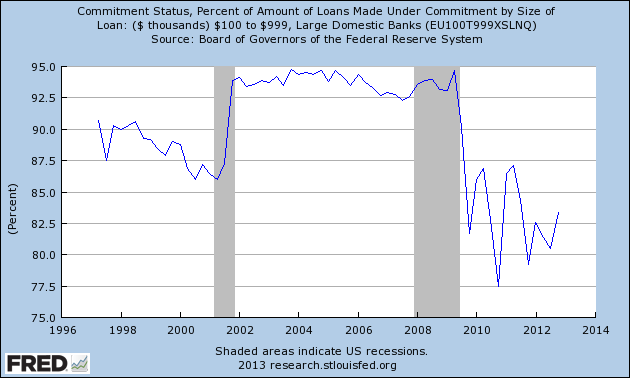 Since the recession won’t recover without it we’ll need to brute force it (the lending) with state regulation. I’m not advocating very much here. We could have something simple like determining how much would have to be loaned out in order to get the economy going once again. Let’s say we set a particular percentage rate for the loan that is attractive to people looking to enter production, or begin another round of production. The rate, I don’t think, would have to be very low, I’m pretty sure there is a decent amount of people looking to get started. Perhaps not all that would be preferable, but enough at least to get things moving. The Federal Reserve could dictate how much of the money given to them must be put out in loans only if the application for the loan met certain minimal requirements. The Fed could do this quite easily and hand a paper to each bank making it flexible enough for them. This mandatory loaning would be a condition of the money given to the banks, meaning they could take the money back if the banks refused to carry out the loans. Once the loan has been made, the bank could be left relatively free to do as they saw fit with their relationship with the customer. Of course there would be massive resistance to such a policy, but since we’re talking about saving the economy I think the banks can shut up while we save the economy from their actions. Americans particularly hate to hear this, but the only solution I see in this situation is government control. The banks and financial sector are doing what is not in the interests of the economy in keeping it sustainable. What they are doing is only in their own best interests, and that is eventually going to cause another drip in the ongoing recession. This is another contradiction of capitalism; the self-interest motive is inherently driving the destruction of the system of self-interest. Many haven’t managed to get this through their heads yet. They’re still thinking that the free market will solve problems for them; it’s an assumption that still lingers in even the most educated of minds. I think it is this assumption by Harvey that leads us into the dead end we face. Banks can ask for money without intending to loan it out. They can do it with the purpose of only protecting themselves and not thinking about the health or even sustainability of the economy. This is what I mean when we have to keep re-thinking our assumptions when it comes to economics. To my knowledge this problem of banks refusing to loan out money has not happened before, thus we don’t see this possibility in our assumption. We have to learn from the changes in material conditions in order to keep up-to-date assumptions. If not, we all risk ending up like libertarians, still thinking this is 1776 and world works according to that time period. The Marxist understanding of inflation is quite different from the incorrect mainstream one that both Harvey and I have attempted to push into the back ground hoping to never see again. For example our understanding doesn’t include things like assuming perfect competition or full employment. Instead when we analyze it we seek to also understand who is benefitting from the inflation taking place. Inflation and deflation have real serious social costs like increased unemployment, lower real wages and an increase in exploitation. It often shifts income distribution towards the capitalist class along the balance of social forces towards capital and, particularly financial interests. Even more accurate ideas about inflation such as those espoused by Harvey don’t take these latter points into analysis. He does acknowledge that inflation is beneficial to one group over another. What this means is that workers and capitalists fight over the share of profits generated by production. Inflation never affects everyone equally. It shifts buying power from one group to another (even though the winners may still complain because they see themselves as hurt by the overall price increases–what they don’t understand is their role in causing the latter!). In fact, it is the very attempt to capture more income that is at the heart of the inflationary process under these circumstances. Money supply growth did not cause prices to rise, OPEC’s attempt to grab a larger income share did. The difference here with us Marxists is that we see social forces behind the distribution of wealth in an analysis of inflation. Modern economists tend to see social forces as separate from economics, where as Marx saw how they flow together. Marxist analysis begins with an understanding of the social forces in society to see how they relate to the economic system. Obviously this brings us to the question of how Marx saw inflation. The problem is that we don’t really know how he saw inflation all that well. He didn’t write very much on it and as a result his view on it isn’t clear or even relatively clear. So we have to be careful when dealing with it because it’s not too specific. People, like Marxists, who see the world through class struggle tend to support it because it seems to vindicate it. It sees inflationary episodes as something that appears as a result of actions taken by key agents, particularly monopoly capitalists and unionised workers. It implies that these key agents have the ability to set prices of goods and services (mostly) independent of demand for them. Inflation happens because the central bank collaborates with the struggle for control over the ownership of the national income through monetary accommodation. This happens in conjunction with support of the financial system in order to protect financial stability and the continuance of production. The inflation rate is usually a positive function of the size of the overlapping claims, the frequency of price and wage changes and the degree of capacity utilisation, and a negative function of the rate of productivity growth (the basic model can be refined endlessly by incorporating target income levels, expectations, reaction functions, and limits on the wage claims because of unemployment, or on the mark up because of competition). The problem with this view of inflation is that it is very vague. There isn’t a clear view of the internal structure. As a result this theory can viewed as correct from different economic standpoints. When it is not grounded by a broader structure it conflates cause and effect since inflation has distributive implications, income disputes cause the process.